YESLER WAY, Seattle, Saturday (MSBBC) — Microsoft today stealth-released its new social network, Bing Minus, automatically adding every person in the world still using Internet Explorer, such as your mother. The Bing Minus software was distributed Friday morning in an automatic urgent mandatory critical Windows security update. It will also be available on Windows Phone 7 and BlackBerry. 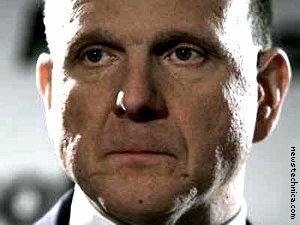 “Social networking is the new primary focus Microsoft is betting the business on,” said CEO Steve Ballmer, defining “the business” as “my job.” “It’s already banned in China!” he proudly declared, although Chinese contacts deny this. Productivity has also increased in offices containing Bing Minus users. Bloggers and tweeters are already swapping tips on how not to obtain Bing Minus invitations every time you click on anything whatsoever in IE or Windows itself.